"New" Coach Lance West is well into his first season back as Head Football Coach of the CHS Cardinals. 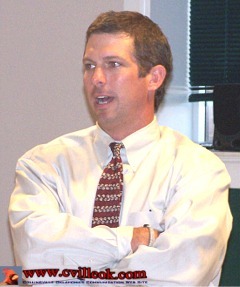 West had been with the Collinsville schools before from 1993 to 2000. He had been the successful head coach here before a stint in private business and then several other area schools. The 41 year old coach said he was happy to be back at Collinsville and gives credit for the current success to good kids and staff. He explained the "Code Red" philosophy which he brought with him from his previous endeavors. West says the players and coaches have bought into the philosophy which he also uses in his personal and business activities. The philisophy is based on core vaules being the basis of each action and decision. 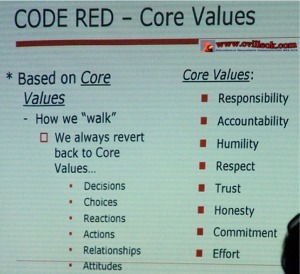 Those core vaules are: responsibility, accountability, humility, respect, trust, honesty, commitment and effort. He and the team have a vision with priorities and expections. "Great expectations bring great results". Ben Ostrander was a guest at Thursday's Chamber luncheon meeting. Ostrander's Funiture & Appliance was the October luncheon sponsor. 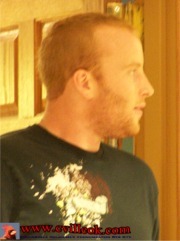 Ben had recently been honored with a fitness award in his Air National Guard activity. Ben is a 2004 CHS grad.